I’m finding the whole process of renovating our house fascinating but, now we are at the rebuilding stages after having stripped everything away, it’s getting exciting. 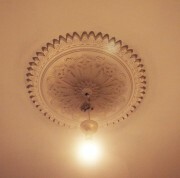 I’m really enjoying doing my research and finding companies to supply fixtures and fittings, and one of these such gems is Miles and Wilde who create cast plasterware from original features in residences dating back to the eighteenth century. 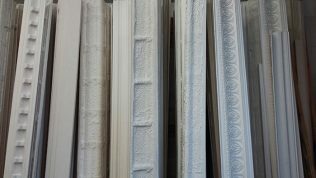 They’ve been commissioned to install the fibrous plasterware for Bond Street brands such as Hermes and Cartier, and luxury projects such as the Berner Street Hotel. I had been in two minds about whether to remove the plaster cornicing in our house as it was clearly original. However it had been so damaged with botched repairs that I decided in the end it would be simpler to replace it entirely rather than try and restore what was there. I didn’t have the same reservations about the ceiling roses which were B&Q horrors that were like the ugly cherry on top of the unattractive ceilings that had each been covered in textured wallpaper. It all came down with my blessing, so I then had to source plasterware that was appropriate to the age and style of the house. Discovering that Miles and Wilde were a local company based in a warehouse in Peckham, I dropped by to see how they make their products. 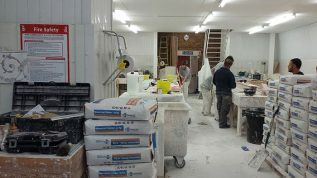 Their small team were busy creating casts for the numerous projects they had on the go and one corner of their workshop was stacked full of finished lengths of cornicing. It was a cornucopia of beautiful eighteenth and nineteenth century detailing. 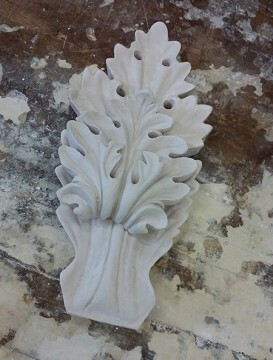 One of the directors, Leigh Miles, showed me around and described how they make moulds from the existing plasterwork in grand residences in and around London, which can then be cast from only a handful of times before the detail starts to be lost. He showed me how the inconsistencies and imperfections in the plaster finish are part of the appeal of these plaster pieces and set them apart from the perfect but soulless commercial products. 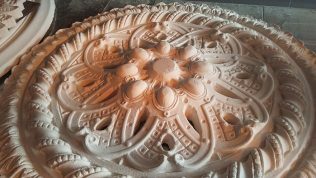 After casting, the plaster roses are taken to their drying hut and slowly dried out with a warm lamp, before being sent out. I was sold! 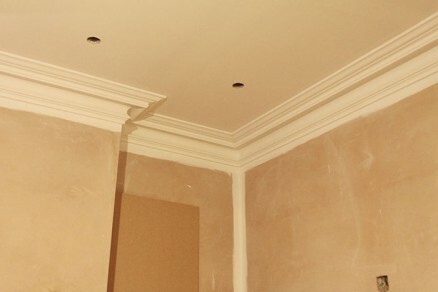 I went straight back to site and measured up and made cardboard cut outs of the ceiling roses I had my eye on to double check that the size would work in the space. 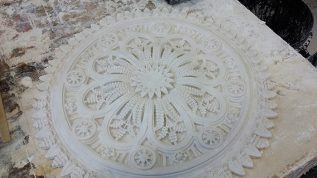 The ceiling roses were ordered and a few days later I had these plus a huge pile of coving on site, ready to be installed. 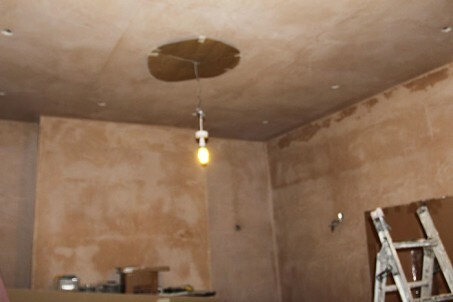 By my next site visit the plasterware was up and I was delighted that I’d made the decision to start afresh. 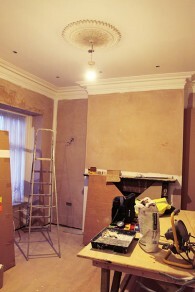 Seeing the ceilings taking shape immediately gave each room character and form. 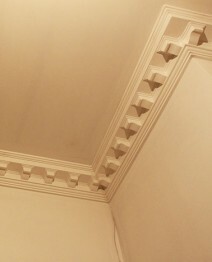 The dentil coving in the hallway could have posed problems in the corners and at the ends, but I was thrilled to see how well my builders had hand-cut and finished the cornicing. 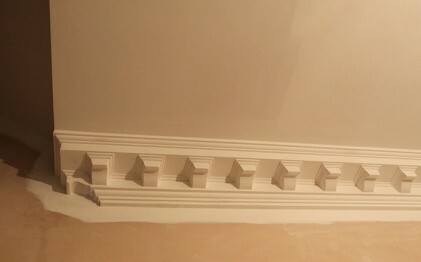 I am rather a perfectionist so seeing this first test of their finishing skills boded well for the rest of the project. Wow…you certainly take on an immense amount but glad to hear you are enjoying it. Certainly will be worth while and you will end up with an amazing abode which you will love …well done you !! !